Reinventing Ritual: Contemporary Art and Design for Jewish Life is currently on exhibit at the Contemporary Jewish Museum (the CJM) in San Francisco. This show investigates the ways in which contemporary Jewish artists react and explore Judaic rituals. Seeing Reinventing Ritual is an interesting way to spend some time while you are in downtown San Francisco. Even though the redesigned building by Daniel Libeskind for the CJM opened to the public in 2008, it is still difficult not to think of it as new. The shape and flow of the building itself becomes part of the art installations. The entrance, the gleaming benches, softly flowing fountains and angular grassy areas all contribute to achieving a contemplative frame of mind. This mental state of quiet contemplation is appropriate when viewing Reinventing Ritual. For most visitors (including your reviewer) many of the Jewish rituals described in Reinventing Ritual will be obscure. Thus, the viewer will naturally tend to evaluate these works on their own merits. However, the exhibition does include a resource area that provides information about traditional and contemporary Jewish ritual. Several works in the exhibition also have an accompanying video that provides further insight into the original ritual. Reinventing Ritual was originally organized by The Jewish Museum in New York City. The pieces are arranged in four thematic nodes: Thinking, Covering, Absorbing, and Building. There are nearly 60 pieces in a multitude of media including installation art, video, jewelry, ceramics, sculpture, textiles and architecture. The strongest initial emotion evoked by this exhibition was the feeling of exclusion. At times, the sense of the artists as outsiders was poignant. A number of pieces were notable. -A gold necklace in the shape of a chicken wishbone was cast with actual bones. The idea of luck and family gatherings associated with chicken wishbones was given an added level of depth and discomfort by making the actual bones into a necklace. Original ritual: Chicken, from which the wishbone is derived, is often consumed on Jewish holidays and at other celebrations. -A video of artist Hadassa Goldvicht behind a pane of glass, licking it until it became so blurry with saliva the artist could no longer be seen was both disturbing and mesmerizing. Original ritual: When a boy turns three, in a number of Orthodox Jewish communities, he attends his first day of school and begins learning to read. His teacher dribbles honey over the aleph-bet (Hebrew alphabet) so that the child may lick it off and know that learning is sweet. -A menorah that looks like it was made up of plumbing parts found in a hardware store, which was actually made of plumbing parts found in a hardware store. 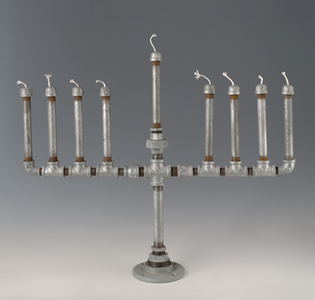 The dull steel, crudeness and obviously hand-made aspects of the menorah were surprisingly moving. Original ritual: The Menorah, an eight-branch candelabrum with a ninth branch for the shamash (helper) has become a powerful symbol of an historical Temple, its restoration, and the Jewish people, and commonly adorns buildings of Jewish worship. -A kimono-like white dress stenciled with red Hebrew letters that would completely cover the wearer including a facemask. This dress evoked claustrophobic feelings in the viewer, yet it created a mood of being fashionable in a contemporary way. Think Lady Gaga. (Michael Berkowitz (American, b. 1952) Fashions for the Millennium: Protective Amulet Costume, 2000. Satin: stenciled. The Jewish Museum, New York, Purchase: Dr. Joel and Phyllis Gitlin Judaica Acquisitions Fund, 2000-75a-h). These artists are trying to take back-or become part of Jewish rituals that they cannot participate in because of their gender, sexual orientation etc. They are outsiders looking into a world they wish to embrace. The variety and creativity of the responses were unexpected. “I eat chocolate pieces in even numbers.” “I spend my birthday having an adventure by myself.” “I see a psychic every year on the spring solstice.” The new rituals by those attending the exhibition showed that people do not need to gain acceptance from groups that exclude them. They are well able to create their own traditions and sense of belonging.